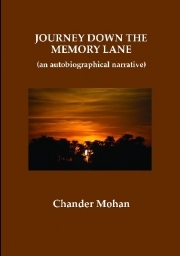 Description of "Journey Down The Memory Lane"
This book is an autobiographical narrative of a person who was born in western part of pre-partition India (which is now in Pakistan) in late thirties of twentieth century and witnessed as a child the holocaust which ensued the partition of the country. The book is essentially a chronological record of the events, places and personalities in India, U.K., Europe, and Middle-east as they impacted the author. It also gives the reader a glimpse of the cultural heritage of north western part of pre-partition India. Prof. Chander Mohan was born on October 8, 1939 in Jehlum (now in Pakistan). His early primary school education was in a village school of pre-partition days. The family migrated to India in August 1947 at the time of partition of the country. Prof Chander Mohan obtained his B.A. (Hons.) in Mathematics (1957) and M.A. in Mathematics (1960) from Punjab University and Ph.D. from Roorkee University in 1967. He has been engaged in teaching and research since 1960. He worked as a lecturer in Mathematics in M.M. Postgraduate college Modinagar (U.P.) from 1961 to 1964. From 1964 to 2000, he worked as lecture, reader and professor in Mathematics department at Roorkee University. He was head of the department from 1995-1999. During this period, he visited England in 1973 and Iraq (1976-79). After retirement from Roorkee University in 2000, he worked as professor and dean Amity School of Computer Science, Noida from 2000 to 2002. From 2002 to 2004, he worked as professor and head mathematics in IILM College of Engineering, Greater Noida. Since 2004 he is working as professor in the department of Computer Science and Engineering in Ambala College of Engineering and Applied Research, Devasthali, Ambala. Prof. Mohan was married to Smt. Tripta Kumari in 1968 and has one son (Rajive) and one daughter (Kavita) both of whom are software engineers and married. Prof. Mohan has been active in research. He has published over hundred research papers in journals of international repute. He has also been invited from time to time to write review articles on the field of his research work. He has also written three books on technical subjects. He was awarded Khosla Research Gold Medal of Roorkee University in 1990. He is recipient of several other awards such as Millennium award of Honour of American Biographical Institute. His name is also listed in several who’s who such as Marquis international who’s who 2009. He is also member of various academic societies such as International Astronomical Union, Operations Research Society of India. He is founder member of indian Astronomical Society and Society for Industrial and Applied Mathematics. Recently he has been selected for ‘Rashtriya Gaurav Award’. Besides teaching and research, the author has also been interested in metaphysical and spiritual aspects. Reviews of "Journey Down The Memory Lane"